HomeArchiveSecret Plan by Putin, Obama to Strike ISIS? Secret Plan by Putin, Obama to Strike ISIS? • Obama seeks Putin’s help while McCain & Co. push for all-out ground war. In what has the potential to be the right way forward, President Barack Hussein Obama and Russian President Vladimir Putin have struck a deal to allow the United States to strike radical Islamists in Syria with the approval of the Syrian government and intelligence cooperation with Russian military specialists in the country. But the deal could be upended if Congress has its way. Neoconservatives on both sides of the aisle, led by the likes of Senator John McCain (R-Ariz.), continue to press for war with Syria. They have pushed through $500 million in funding for training and arming militias in Iraq and Syria to overthrow the Syrian government. In what is clearly an example of a conflicted, if not crazy, U.S. policy, McCain and company want the U.S. to bomb ISIS in Syria while running a ground war in that country with their chosen militia army. What they fail to understand is that some of the groups they would like to arm and train have links to the radical, violent Islamist group ISIS, and are just as extreme. Many will help ISIS thwart any U.S. bombing campaign while ISIS tries to seize the reins of power in Syria. It appears that Obama has finally recognized the message that Putin has been sending him these past three years that running a regime-change war with the help of extreme militias only creates enemies for Russia and America. Obama recently authorized middlemen in Moscow to initiate talks with representatives of the Russian government to find a way to strike ISIS in Syria. As this newspaper has explained in previous reports, Washington and Moscow talk to each other using middlemen, or “cut-outs” as they are sometimes called, generally members of foreign embassies and intelligence services based in Moscow. The two nations communicate in this odd way because of pressure from internationalists inside and outside the U.S. government, who see Putin’s nationalism as a threat to their world order. In this instance, Moscow used French intelligence operatives, who made it clear that, without a deal, Putin would oppose U.S. bombing of Syria. If a compromise could be struck, they told U.S. officials, Putin would persuade the Assad government to cooperate with Washington and would allow Russian and Syrian military specialists on the ground in Syria to help the U.S. defeat ISIS. Moscow articulated the concern that neocons within Congress and the Pentagon might use an agreement to bomb ISIS to also target Assad’s military. In Moscow’s view, if that happened there would be serious consequences. Paris informed Washington a deal with Putin and Assad was the only way for the U.S. not to appear to be the transgressor. Russia, through the French middlemen, stressed Obama had to limit bombings in Syria to ISIS targets only, and any move by Congress to use militias to attack Assad’s forces while the U.S. was bombing would lead to the collapse of the pact. According to a Moscow source, who has spoken before to AMERICAN FREE PRESS, Putin has calculated the destruction of ISIS in Syria could be swift if Obama honors their agreement and allows the Pentagon to coordinate a bombing campaign with Russian and Syrian military assets on the ground. 5 Comments on Secret Plan by Putin, Obama to Strike ISIS? YOUR DOUBTS ARE TRUE. BUT ISLAMIST EXTREMISM IS SOMETHING THAT OUGHT NOT TO BE FUNDED FROM OUR POCKETS. OTHERWISE THEY SHALL DESTROY WHOLE CHRISTIANITY ONE DAY! OK BHO, you have the chance to do something right here. Don’t blow it. See how nice Pooty Poot is being to you even though you’ve acted like a jerk re: Ukraine. Let the Israelis scream their kipas off–Assad, much better for the world to deal with than the ISIS crowd. Much better for everyone–including Israel. Let John McCain posture and pose and do his war dance all he wants. Please Barry, all we are saying if give Pooty a chance. 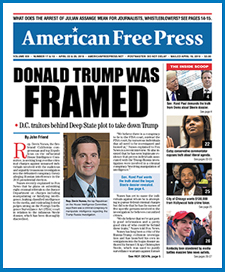 The article does not belong to the American Free Press but to the Main Stream Media deception cartel. It seems that Putin is the only adult in the room at the moment. He is even talking to us when we instigated a coup to overthrow the Ukrainian duly elected President. Why does the American public not know this? Sorry I remember now…the big war corporations profit greatly on the taxpayer’s war dollar. Why should they tell us the truth on their corporate owned media…bad for business!!!! Democrats and Republicans are promoting ISIS across MSNBC, CNN, and FOX.